My original jsTree checkboxes post is still my most popluar, yet it is 18 months old and no longer works with the latest version of jsTree (pre 1.0). Since that post is so popular I thought I should update it. My first surprise was how much the jsTree guys changed their API between releases – I was only going from version 0.9.9 to version 1.0, but I had to practically start from scratch. Notice how “Origination” appears half-checked because only some of its children are checked. Briefly, jstree has a number of ways of poplulating the tree with data – in my previous jsTree post I was populating the tree via AJAX but for now the tree is populated via hardcoded JSON (using the built-in "json_data" plugin). Don’t forget to specify the "checkbox" plugin too. Just like last time, let’s create a viewmodel for creating the tree structure. Now let’s change our controller to create a viewmodel, serialize it to JSON, and pass that string to our View. Let’s put our tree inside a <form> and submit it. What about telling the tree to pre-check some items? So how do we render the tree with some items already checked? Notice how we added “public bool selected” to JsTreeAttribute? This doesn’t do anything as far as the checkboxes are concerned, but it does add a custom property called “selected” to each node’s <li>. We can use that to tell the jsTree to check the given node, by binding to the ‘loaded.jstree’ event. You’ll see that the nodes that are marked with selected=true in GetTreeData() are now pre-checked when you first load the page. Here’s a link to the solution (VS 2010). I was playing with ASP.NET MVC3 (RC2) and I couldn’t get jQuery UI’s datepicker to work for me in a partial view. It would always say datepicker is not a function. It took me a while to figure out the problem is. The problem was I didn’t notice that the MVC scaffolding had added a reference to jQuery to the top of my partial view. This reference to jQuery was wiping out the earlier reference to jQuery UI in layout page. The solution was to remove the reference to jquery in my partial view (Job.cshtml). I also decided to remove the reference to jQuery UI from the layout page (_Layout.cshtml) and add it to the partial view (Job.cshtml). After one year this is still the most popular post on my blog. 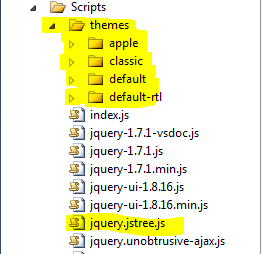 However, this uses jsTree v0.9.9a2 and jsTree is now in version v1.0 which has changed completely. This post does not work with jsTree v1.0!!! 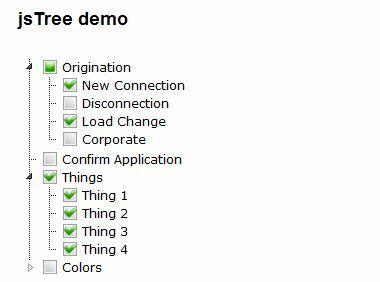 This should create a basic treeview with checkboxes, with static data. Not very interesting yet. Now our tree should be populated with the same data as Figure 1. So how do we render the tree with some items already checked? My colleague Paul came up with this problem and the solution. Notice how we added “public bool selected” to JsTreeAttribute? This doesn’t do anything as far as the checkboxes are concerned, but it does add a custom property called “selected” to each node’s <li>. We can use that to tell the jsTree to check the given node, by using the jsTree’s callback option. You’ll see that the nodes that are marked with selected=true in GetTreeData() are now checked when you load the page. Here’s a link to the solution (VS 2010) with code samples. What’s this? I know you thought this was supposed to be a .NET blog, yet so far all I’ve posted is jQuery and iPhone stuff. Well the idea of this blog is that I will post stuff I’m learning on the job, and at the moment I’m learning a lot about jQuery, so here we go. This continues on from the Knowledge Base project I used in a previous post. In this example, I start out on the “Help” page. I navigate to the Browse page, and then within the Browse page I we have a page which shows/hides different sections when the mouse is clicked. 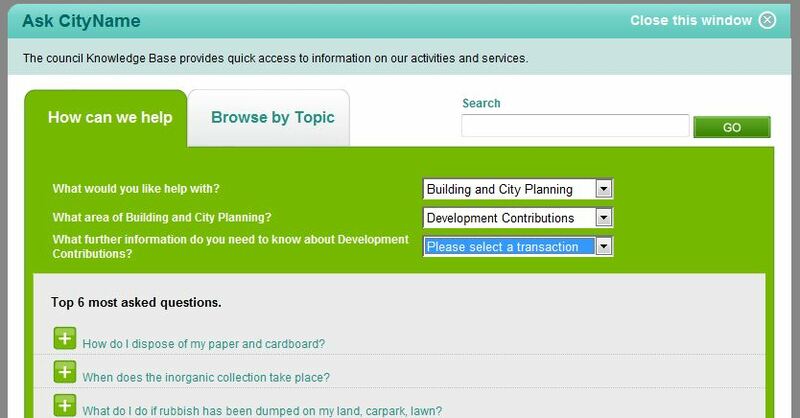 In this example, I start on the Help page and navigate to a FAQ using cascading drop-downs. I choose a value from my “level1” dropdown, Animal Control. The “level2” drop down is populated with Animal Control-related topics, and I choose Dogs. The results pane is loaded with Dog-related FAQs, and I expand the first result, about micro-chipping dogs. I click a link to view the Dogs topic, and then click the browser back button. The browser takes me back to the Help page, but my previous state (viewing the “Do the dogs need to be microchipped” FAQ) isn’t displayed, instead the Help page is in its initial state. We want to make it so that when the back button is clicked, we’ll be returned to the FAQ we were viewing on the Help page. To get the back button working, we need to kind of trick the browser into thinking that we’re navigating up and down within the same page by adding # tags to the address. There are a number of jQuery plugins for doing this and I tried out a few – jquery history plugin, history, and jQuery BBQ. 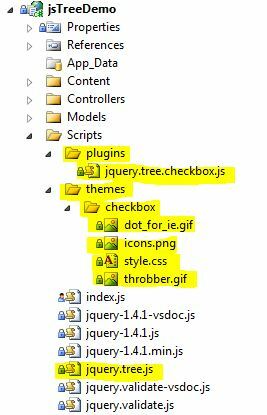 I originally got it working with jQuery history, but it wouldn’t work properly for IE7. So I tried again with jQuery BBQ and it worked fine across all our target browsers – IE6, IE7, IE8 and FireFox. // added. This is called when we load the page by pressing back, fwd, or refresh. Now when I select “Animal Control” from the level 1 (aka Service) drop-down, jQuery.BBQ will 1. add “#level1=1” to the current page location, i.e. the address bar in the browser, and 2. call my historyCallback function which will do the work that used to be defined in the dropdown change event. #1 tricks the web browser into thinking that I’m now on a different page, which adds a new entry into the browser’s history so that clicking Back in the browser will take me to the previous page. 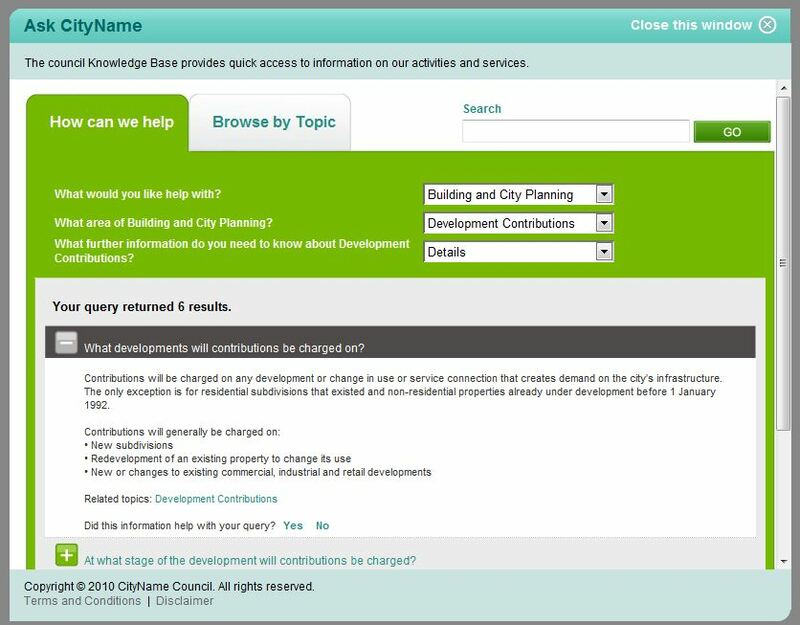 Now we need to define our callbacks which actually do the work of populating the cascading drop downs and displaying FAQs. Remember, historyCallback() will now do the work that used to be defined in onSelectChange(). levelOneCallback() asks jQuery.BBQ if the level1 has been selected, and if it has been it loads up the level2 drop down. If level1 isn’t specified then we should explicitly reset the level1 dropdown. So, when I choose a value from the first dropdown, #level1=3 is added to the URL of the page. When I choose a value from the second dropdown, #level2=7 is added. For brevity I have omitted the code which adds #question=55 to the URL when a question is clicked. Once again I navigate through the drop downs, as before, but this time when I click back, we’re brought back to the previous state which is viewing the question about microchipping dogs. As I keep clicking back, each previous state is loaded. And then when I click Fwd, my previous actions with the dropdowns are repeated! I’d like to thank “Cowboy” Ben Alman for the jQuery BBQ library and also for suggesting some improvements to my code. Although I am a .NET developer, a recent small project I was working on wasn’t .NET but just plain ol’ HTML pages. I’m our team’s jQuery expert but that’s not saying much at all – I only earned that title by buying jQuery in Action and I have it sitting on my desk. The project was a Knowledge Base. The requirements were that the user would choose a topic from a drop-down, then a subtopic, then a sub-sub topic and finally the “Questions” relating to that topic would be displayed. So away we went, writing and implementing “GetSubTopicsForTopic” web services which would populate the cascading drop downs. Fine and dandy. Obviously, depending on which sub-subtopic they choose, the number of “Questions” returned will vary. Some subtopics (e.g. Contact Us”) will only have one Question while others would have 5 or 6. We would need to dynamically generate the HTML to display each Question (and it’s Answer) and then inject it. Here’s our jQuery.ajax call to get the Questions for the sub-subtopic. We first used .getJSON but were having some concurrency issues with it, so changed to .ajax and set async to false. Now that we’ve gotten an array of Questions back we need to render them. What developments will contributions be charged on? A parent <li> followed by a bunch of child nested <div>, all within a <ul>. I’ve seen this done on a number of projects. e.g. Option 2 is more code than Option 1. As a programmer it feels cleaner, since I’m manipulating properties on objects rather than having hard-coded HTML. But it’s less readable than Option 1 and would be more difficult to change the HTML. This was an idea that I came up with, it’s probably been done somewhere else before but I’ve never seen it. Update: Ha, although I came up with this idea myself, Rick Strahl blogged this exact same technique way back in October 2008, he calls it ‘Manual’ Templating. I’ll have an invisible “sampleQuestion” which contains the <li> and all its <div> embedded in the HTML. I’ll use jQuery to make a copy of this sample Question, change some attributes, make it visible, and then add it to the DOM. I only just found out about this, but a number of existing jQuery solutions exist for dealing with this exact scenario. Rick Strahl’s blog post looks at a few, and now Microsoft have proposed their own solution which might be added to jQuery in the future. On the Knowledge Base project I implemented a ‘manual’ templating solution because I didn’t know better, but jQuery has a number of solutions for generating and injecting HTML content which are worth further investigation.